Indonesian culture is steeped in the smoking, selling and growing of tobacco. Cheap cigarettes, ubiquitous tobacco advertising, a powerful tobacco industry and lack of government enforcement are fueling a national addiction. Nearly 70% of the men in this predominantly Muslim country smoke-- making it the highest rate amongst men in the world and it often begins from childhood. 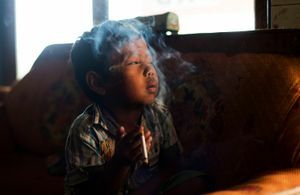 This on-going series captures young child smokers in villages and cities across Indonesia. 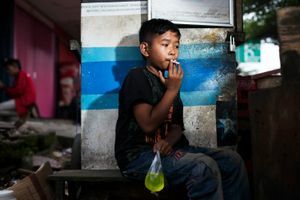 These addicted children are growing up in an age when demand for tobacco is growing and foreign tobacco giants such as Marlboro maker Philip Morris are establishing themselves as smoking rates decline in some developing countries. 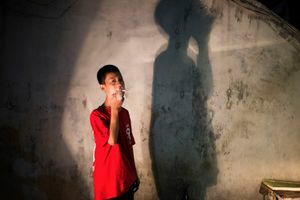 As various parties stand to gain, smokers in Indonesia are getting younger-- by 2010 there were at least 426,000 smokers 10-14 years old up from 71,000 in 1995.